Extraordinary Ministers of Holy Communion (EMHC) are needed for every Mass. Any Catholic in good standing may be an Extraordinary Minister of Holy Communion. 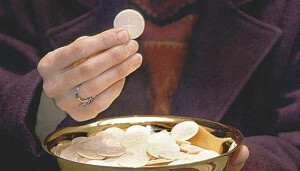 EMHCs assist in distribution of the Eucharist to the congregation during Mass. They assist in setting up the altar for Mass and cleanup afterward.